As I promised on Monday, today I have a pumpkin recipe to share! These cookies have been a work in progress in my mind since the summer (when baking with pumpkin felt like wearing white after labor day). 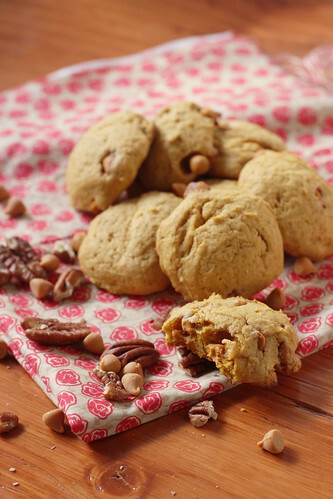 I envisioned a soft, cakey cookie with a punch of butterscotch and the warmth of spiced rum soaked pecans. Now that fall is in full swing, the cookie of my dreams has finally come to life! Every year my mom and her sister make a sweet treat called Bourbon Balls to give away for Christmas. Bourbon Balls are basically nuts that have been soaked in liquor and dipped in chocolate. Inevitably, there is always at least one jar of soaked nuts left after all of the Bourbon Balls have been made. 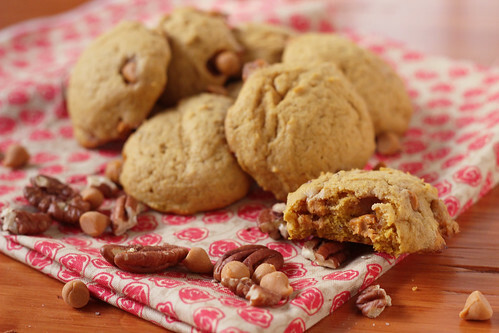 One year I decided to throw the leftover soaked nuts into my favorite pumpkin blondie recipe and I could not believe how amazing they tasted. You couldn’t really distinguish the bourbon, but there was this added warmth that was incredible. That’s what I had in mind when I thought of these cookies. In order for the flavor to really shine through, I would recommend soaking the pecans at least 24 hours ahead of time. Of course you don’t have to soak your pecans in spiced rum, it’s not like you can go wrong with the pumpkin, butterscotch, pecan combo on it’s own. You could probably even get away with a shorter soak. But if you do take the time to do it, I promise you won’t be disappointed. *To soak the nuts – Place 1/2 cup of chopped pecans in a liquid measuring cup and pour in enough rum to completely cover the nuts, plus just a little more. Cover with saran wrap and soak overnight, drain of excess rum but do not rinse. Does not need to be refrigerated when soaking. **I used less than a 1/2 cup for the batch in the photos, later I really wish I would have used more so this recipe reflects that. If you really love nuts you could even go as much as 3/4 of a cup. Preheat the oven to 375 degrees. Line baking sheets with parchment paper, set aside. In a medium bowl, whisk together the flour, spices, baking powder, baking soda, and salt. Set aside. In the bowl of a standing mixer fitted with a paddle attachment, beat butter and sugars until light and fluffy. Add eggs one at a time and beat until combined. Add the pumpkin and vanilla and beat until combined, scraping down the sides of the bowl as needed. The mixture will look curdled, that’s OK. Gradually add the dry ingredients to the bowl and mix until well combined, scraping down the sides of the bowl as needed. Stir in butterscotch chips and soaked pecans. Using a medium cookie scoop (or heaping tablespoons), place the dough 2 inches apart on the baking sheet. Bake for 15-18 minutes or until the tops no longer look wet and the edges are golden brown. Cool cookies on the cookie sheet for 1 minute, then transfer to a wire rack. Brilliant combination! Nice and fluffy looking, yet somehow crispy? yum yum! If you do not want to use the rum, I think soaking the nuts can be completely omitted. Of course you can always experiment with other liquids, too!